I make this cake by order. A friend of mine celebrating a beautiful young lady birthday. As I do not have full set of cake to display and for them to choose what cake they can order. Always they will allow me to do my own research and have a theme for me to create/make something that will surprise them . So the order is simple yet can be tricky. 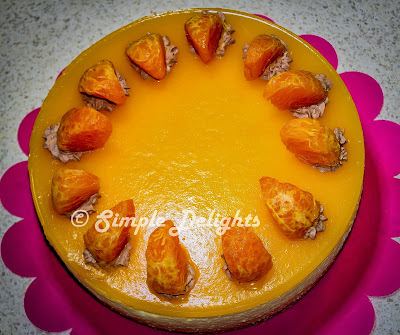 She love cheesecake and orange is her favourite fruit. :) Well I do have one cake that I would love to try out and bake in this theme. I am happy to take up this order and have this cake make for their special occasion. I have been reading this young lady blog for awhile. I find her really talented. I guess she must have some sort of experience in western pasteries café. The picture and the cake she make was so stunning and above normal standard. The plating was just like fine dining desserts. This is one of her cake I would love to make. There is a couple of it , I would love to try out in future. I do not have confident to deco the cake like some of hers. It really take time and patience to create cake as such . She is now lodging her first Icook book in Ipad. I have downloaded and it is really great and easy to follow. Half the portion as I only need one layer. 5. Beat the egg mixture till pale and thick in volume. If you can draw a line with the mixer and the line will not disappear then is done. 6.Fold the flour into the the egg mixture with spatula in 3 separate portions. 8. Pour in the well mixed butter milk and the orange zest into the cake mixture and combine until well incorporate. 10. When done baking , let the cake cool in the mould and take it out, set aside for later use. 1. Break the biscuit into fine crumb and mix well with the butter. 2. Press evenly into the 8" spring form round mould . 3. Refrigerate at least 30 mins. 1. Pour water in a bowl, sprinkle gelatine powder on it , let it bloom. Place the bowl in a bowl of hot water allow the gelatine to melt. 2.Combine 200ml orange juice and sugar in a saucepan, bring it to boil. 4. Add in the remaining orange juice , stir well. 5. Set 400ml aside for the filling and 60ml for brushing the cake & the remaining for the top layer. 2. In a mixing bowl, beat the cream cheese till smooth , add in orange jelly in small portion and continue to beat till smooth. 2. Blush generous amount of orange juice on the sponge cake. 3.Pour in all the creamcheese filling. 5. 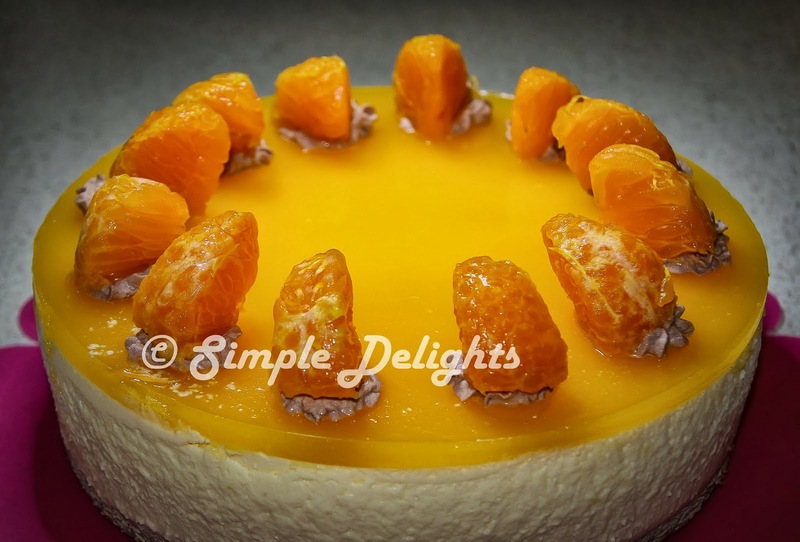 Lastly carefully pour the orange jelly onto the creamcheese layer. 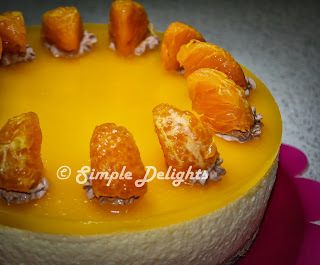 When I attempt to make this cake, I was concern while waiting for the creamcheese to set the orange jelly might get solidify. However this will not happen, as the gelatine will not set so fast in the room temperature . If you worry, just stir the orange jelly mixture on off to prevent it to set. The verdict is satisfied customers. They love the taste of the cake and the orange is strong to the birthday gal liking. This cake is kind of simple though the step seem long. Give it a try you might impress those who love orange and cream cheese.